Surround yourself with casually elegant California style, an ideal location, and exceptional service. Amenity-filled accommodations, appetizing cuisine, preferred recreation, superior facilities, and a friendly, dedicated staff are here to exceed your every expectation of a business-class hotel. Our seven-story hotel, with its beautifully landscaped outdoor pool area, creates the relaxing atmosphere of a getaway hotel. Come in and discover the impressive difference of the new Four Points by Sheraton Los Angeles International Airport.Special ConditionPlease be aware that as of June 11, 2007, pets are no longer allowed. All reservations made on or before June 11, 2007 will still be honored for pets. A $25 non-refundable fee per pet will be charged at check-in. 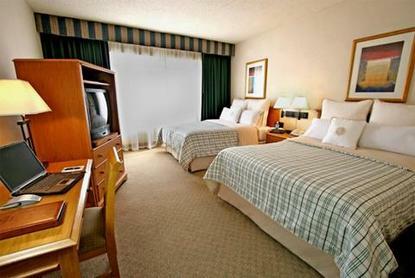 The room will be assessed for damages upon checkout and the guest will be charged accordingly if there are any damages. Please contact the hotel for more information.